Birdsboro Steel Foundry and Machine Company Foundry Pattern on display in the Berks History Center Museum. Birdsboro Steel Foundry and Machine Company traces its beginnings back to 1740 when William Bird built a forge, a saw mill and grist mill and founded the town of Birdsboro. His oldest son, Marcus, enlarged on his father’s work and constructed Hopewell Furnace. He was the largest producer of iron in America during the Revolutionary War. After the war, the forges have financial problems caused the Birds to sell their assets to Matthew Brooke changed the name to the Birdsboro Iron Foundry Company. The forges were most successful under Brooke’s management in the mid-19th century. During the Civil War, the company produced munitions and armaments for the Union Army and began manufacturing parts for railroad cars and locomotives. This was the beginning of steel production for the family. The company continued its tradition of supplying the armed forces with providing the Navy with material for building a steel fleet during the late 19th century. In 1906, the management decided to erect a large modern steel foundry with a potential capacity of approximately 3000 tons per month for making steel castings. In World War II, the government contracted with Birdsboro Steel and Foundry and Machine Company to produce tanks and artillery for the war effort. In 1944, a manufacturing subsidiary was established for weapons manufacturing known as Armorcast. By the end of the war, the company began to manufacture more industrial equipment, many used in the production of steel. After 1947, the federal government and several businessmen tried to sell or use the space. Armorcast failed to win a government contract to continue production in 1975 and the plant closed in 1988 after a lengthy strike. The four smokestacks, collapsed in the planned implosion to make way for a new power-generating facility, were the last vestiges of a regional history of manufacturing started before the American Revolution. In January, 1862, the 93rd Pennsylvania Regiment passed in review along Pennsylvania Avenue of the nation’s capitol. Among those who reviewed the troops was Abraham Lincoln, the President of the United States. When the Reading Zouaves passed the reviewing stand Lincoln’s attention was attracted by the tall lanky private who towered high above his comrades. A signal from the President to the captain of the Zouaves led to the order to Shaaber to fall out of line and approach Lincoln. “How tall are you?” asked Lincoln. “Six feet six and one-half,” replied the Berks volunteer. Then, as Shaaber related it years later, Lincoln introduced himself, “I am old Abe,” and then introduced Shaaber to Hannibal Hamlin, the vice president. After the interview Lincoln gave the soldier a pass permitting him to rejoin his regiment and inviting him to visit at the White House. Several months later Shaaber and Sergeant Fritz of the Zouaves paid a call upon the President in the executive mansion. They were ushered into the Blue Room and there were greeted by the President. Lincoln invited his Berks County guests to dine with him. The young men lost courage and fumbled for excuses. According to Shaaber’s testimony he “preferred bean soup and hard tack better than a reception dinner.” In later years the Reading chief of police expressed regret that he had not accepted the President’s invitation to dine. 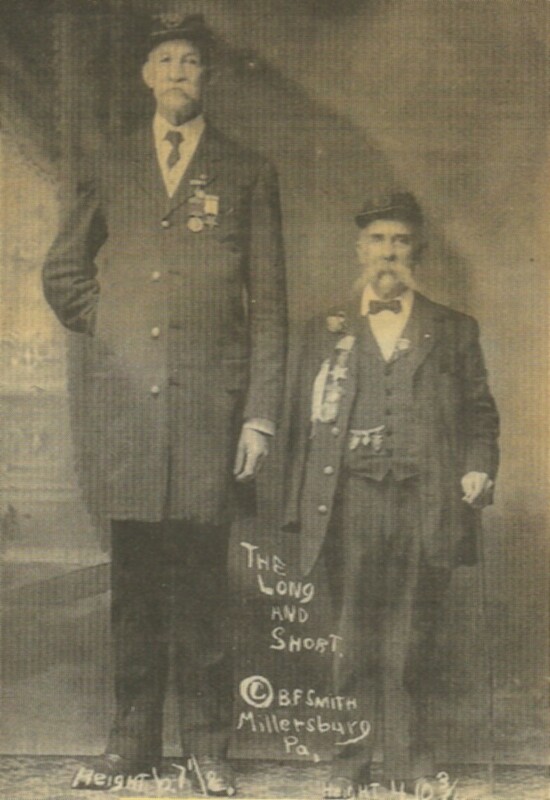 Archival Notes: For more information please refer to Norman Gasbarro’s blog, http://civilwar.gratzpa.org/2013/01/mahlon-shaaber-tallest-soldier-of-the-civil-war/ He does an excellent job of providing a more detailed account of Mahlon Shaaber.